USA (MNN) — Prayer: it’s how Christians communicate with God. What does this mean for Deaf Christians? The Deaf communicate through sign language…. does God understand that? Does God understand all of the sign languages used by the 70 million Deaf people worldwide? Severa is a Deaf believer connected to Deaf Bible Society. Through an interpreter, she tells Mission Network News these are common questions in the Deaf community. Whether Deaf or hearing, all new believers face the same challenge – spiritual growth doesn’t happen until they have God’s Word in their language and someone to teach them about Christ. Both are severely lacking in the Deaf world, so many new believers have no way to know what God is like. However, when Deaf Christians do encounter spiritual truths – like Severa learning about prayer – the results are life-changing. Growing up, Severa was surrounded by praying people. Her mother, also Deaf, loved to pray and faithfully attended church. Severa went with her and saw a man on the cross; she learned his name was Jesus, but her mother would not explain why He was crucified. At school, teachers told Severa to write down Bible verses and pray silently at their desks. People from the church came frequently to Severa’s house and prayed over her family. Time and again, Severa asked, “why?” but no one offered an explanation. Years passed, and Severa learned – as many Deaf do – how to live with unanswered questions. Everything changed when a Deaf friend offered to explain why Jesus was on the cross. As this friend signed the Gospel truth, “I finally understood and entered into relationship with Jesus,” Severa says. Through a discipleship series called MasterLife: Developing a Rich Personal Relationship with the Master, Severa finally found answers to her many questions about prayer. “It doesn’t matter what the situation [is] that occurs in my life, no matter what I go through, I hold onto that. I hold onto that – being able to talk to God through prayer – and I know God answers, I have seen it many times,” she says. Prayer is an important principle for Deaf and hearing believers alike. 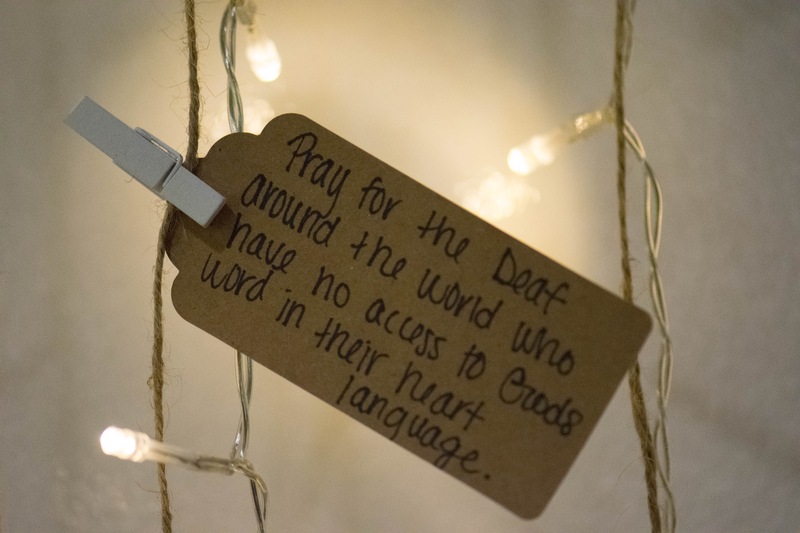 It’s also an easy way for hearing believers to partner with Deaf Christian workers. Just text the word “pray” to 444999, and you’ll start receiving prayer requests from Deaf Bible Society. 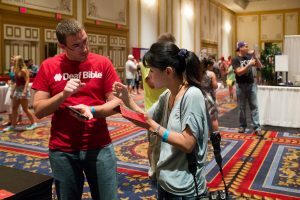 As we mentioned last month, Deaf Bible Society is looking for approximately 200 prayer warriors to come alongside their efforts in 2019. “Pray for somebody to go into Deaf communities and explain things to them,” Severa requests. Header and story image courtesy of Deaf Bible Society. Ask the Lord to raise up Deaf Christian teachers. 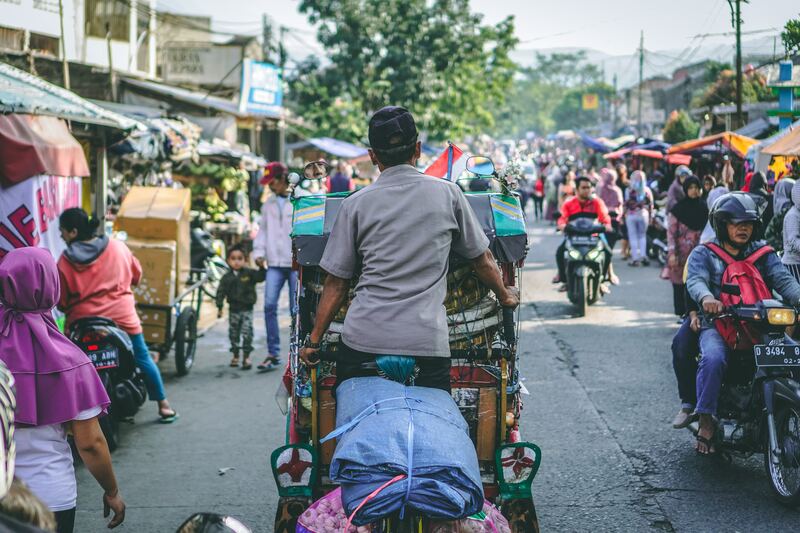 Pray for funding and resources to begin Bible translations in more sign languages.